M-C. Amann and J. Buus, Tunable Laser Diodes (Artech House, Boston, 1998). 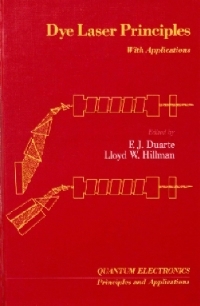 C. A. Brau, Free-Electron Lasers (Academic, New York, 1990). G. Dattolli et al., Lectures on the Free Electron Laser Theory and Related Topics (World Scientific, London 1993). 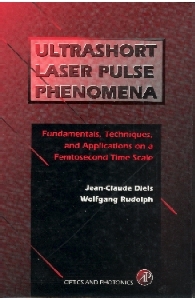 J. C. Diels and W. Rudolph, Ultrashort Laser Pulse Phenomena (Academic, New York, 1996). 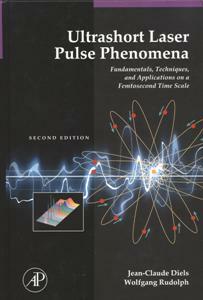 J. C. Diels and W. Rudolph, Ultrashort Laser Pulse Phenomena, 2nd Ed. (Elsevier Academic, New York, 2006). F. J. Duarte and L. W. Hillman (Eds. ), Dye Laser Principles (Academic, New York, 1990). F. J. Duarte (Ed. 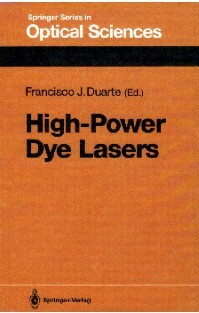 ), High Power Dye Lasers (Springer-Verlag, Berlin, 1991). F. J. Duarte (Ed. 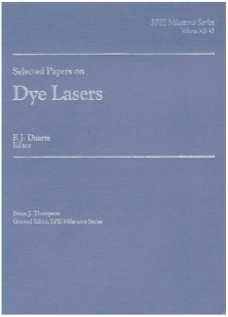 ), Selected Papers on Dye Lasers (SPIE, Bellingham, Wa, 1992). F. J. Duarte (Ed. ), Tunable Laser Applications (Marcel Dekker, New York, 1995). F. J. Duarte (Ed. 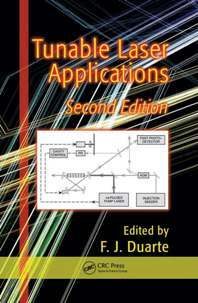 ), Tunable Laser Applications, 2nd Ed. (CRC, New York, 2009). F. J. Duarte (Ed. 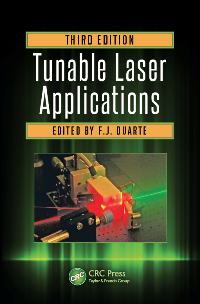 ), Tunable Laser Applications, 3rd Ed. (CRC, New York, 2016). F. J. Duarte (Ed. 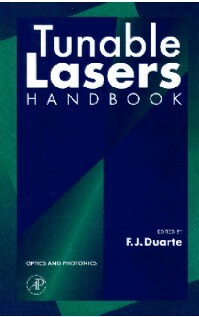 ), Tunable Lasers Handbook (Academic, New York, 1995). 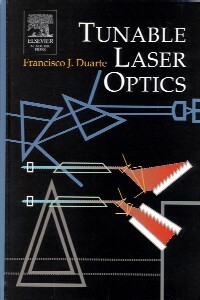 F. J. Duarte, Tunable Laser Optics (Elsevier Academic, New York, 2003). 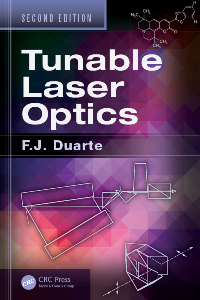 F. J. Duarte, Tunable Laser Optics , 2nd Edition (CRC, New York, 2015). F. J. Duarte (Ed. 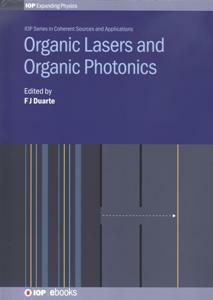 ), Organic Lasers and Organic Photonics (Institute of Physics, London, 2019). P. Hammerling, A. B. Budgor, and A. Pinto (Eds. ),Tunable Solid State Lasers (Springer-Verlag, Berlin, 1985). M. Maeda, Laser Dyes (Academic, New York, 1984). L. F. Mollenauer and J. C. White (Eds. ), Tunable Lasers (Springer-Verlag, Berlin, 1987). A. Mooradian, T. Jaeger, and P. Stokseth (Eds. ), Tunable Lasers and Applications (Springer-Verlag, Berlin, 1976). W. Rudolph and B. Wilhelmi, Light Pulse Compression (Hardwood Academic, London, 1989). F. P. Schäfer (Ed. 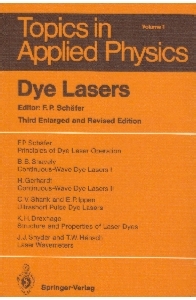 ), Dye Lasers, 3rd Edition (Springer-Verlag, Berlin, 1990). M. Stuke, Dye Lasers: 25 Years (Springer-Verlag, Berlin, 1992). D. M. Tratt, A. K. Kar, and R. G. Harrison, Spectral Control of Gain-Switched Lasers by Injection Seeding, in Progress in Quantum Electronics , Volume 10 (4) (Pergamon, New York, 1985). C. Ye, Tunable External Cavity Diode Lasers (World Scientific, London, 2004). M. Bass (Ed. ), Handbook of Optics , Volume I (McGraw-Hill, New York, 1995). M. Bass and M. L. Stitch, Laser Handbook , Volume 5, (North Holland, Amsterdam, 1985). T. G. Brown et al. (Eds. 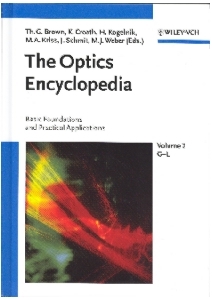 ), The Optics Encyclopedia, Volume 2, (Wiley-VCH, Weinheim, 2004). K. Chang (Ed. ), Handbook of Optical Components and Engineering (Wiley, New York, 2003). W. Demtröder, Laser Spectroscopy , 2nd Edition (Springer-Verlag, Berlin, 1995). 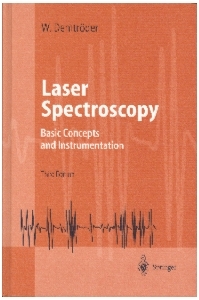 W. Demtröder, Laser Spectroscopy , 3rd Edition (Springer-Verlag, Berlin, 2003). 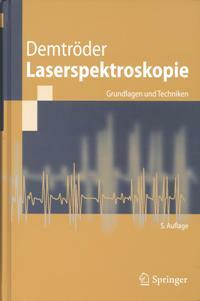 W. Demtröder, Laserspektroscopie: Grundlagen und Techniken, 5th Ed. (Springer, Berlin, 2007). W. Demtröder, Laser Spectroscopy: Basic Principles (Springer, Berlin, 2008). W. Demtröder, Laser Spectroscopy: Experimental Techniques (Springer, Berlin, 2008). G. W. F. Drake, Springer handbook of Atomic, Molecular, and Optical Physics (Springer, Berlin, 2006). G. Driggers (Ed. 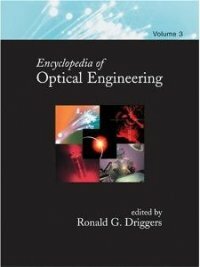 ), Encyclopedia of Optical Engineering (Marcel Dekker, New York, 2003). F. J. Duarte (Ed. ), Coherence and Ultrashort Pulsed Laser Emission (Intech, Rijeka, 2010). F. J. Duarte, Quantum Optics for Engineers (CRC, New York, 2014). 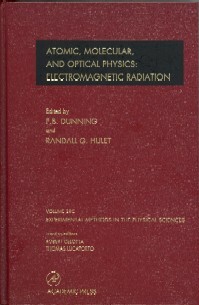 F. Dunning and R. G. Hulet (Eds. ), Atomic, Molecular, and Optical Physics: Electromagnetic Radiation (Academic, New York, 1997). A. C. Eckbreth, Laser Diagnostics for Combustion Temperature and Species (Abacus, Cambridge, Ma, 1988). H. Ghafouri-Shiraz, Distributed Feedback Laser Diodes and Optical Tunable Filters (Wiley, Chichester, 2003). J. Hecht, Laser Guidebook , 2nd Edition (McGraw-Hill, New York, 1992). H. Jelinkova (Ed. 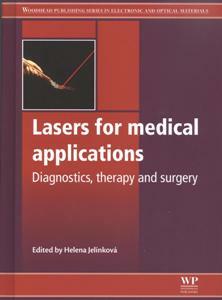 ), Lasers for Medical Applications (Woodhead, London, 2013). R. M. Measures, Laser Remote Sensing (Wiley, New York, 1984). R. A. Meyers (Ed. ), Encyclopedia of Lasers and Optical Technology, 3rd Edition, Volume 8 (Academic, New York, 2002). A. B. Myers and T. R. Rizzo (Eds. ), Laser Techniques in Chemistry (Wiley, New York, 1995). H. S. Nalwa (Ed. ), Handbook of Advanced Electronic and Photonic Materials, Volume 7: Liquid Crystals, Display and Laser Materials (Academic, New York, 2001). M. Ohtsu, Highly Coherent Semiconductor Lasers (Artech House, Boston, 1992). R. C. Powell (Ed. ), Selected Papers on Solid State Lasers (SPIE, Bellingham, Wa, 1991). L. J. Radziemski, R. W. Solarz, and J. A. Paisner (Eds. ), Laser Spectroscopy and its Applications (Marcel Dekker, New York, 1987). J. F. Ready and R. K. Erf (Eds. ), Laser Applications (Academic, New York, 1984). C. K. Rhodes (Ed. 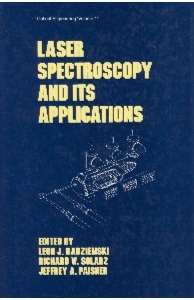 ), Excimer Lasers (Springer-Verlag, Berlin, 1979). B. E. Saleh and M. C. Teich, Fundamentals of Photonics (Wiley, New York, 1991). A. E. Siegman, Lasers (University Science, Mill Valley, Ca, 1986). W. T. Silfvast, Laser Fundamentals (Cambridge University, Cambridge, 1996). 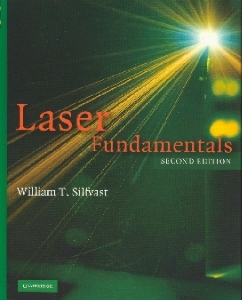 W. T. Silfvast, Laser Fundamentals, 2nd Ed. (Cambridge University, Cambridge, 2003). 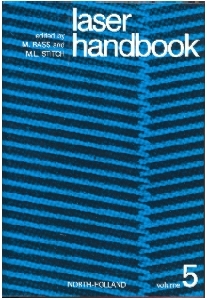 M. L. Stitch and M. Bass (Eds. ), Laser Handbook , Volume 4 (North-Holland, Amsterdam, 1985). C. L. Tang (Ed. ), Methods of Experimental Physics: Quantum Optics , Volume 15 (Academic, New York, 1979). F. Trager (Ed. 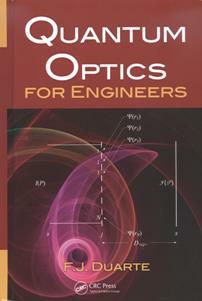 ), Springer Handbook of Lasers and Optics (Springer, Berlin, 2012). G. L. Trigg (Ed. ), Encyclopedia of Applied Physics , Volume 8 (VCH, New York, 1994). G. L. Trigg (Ed. ), Encyclopedia of Applied Physics , Volume 22 (Wiley-VCH, New York, 1998). D. F. Vanderwerf, The Story of Light Science (Springer, Berlin, 2017). R. Waynant and M. Ediger (Eds. ), Electro-Optics Handbook (McGraw-Hill, New York, 1994). R. Waynant and M. Ediger (Eds. 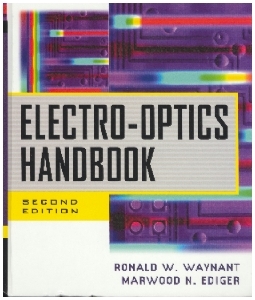 ), Electro-Optics Handbook, 2nd Edition (McGraw-Hill, New York, 2000). C. E. Webb and J. D. C. Jones (Eds. ), Handbook of Laser Technology and Applications (Institute of Physics, London, 2003). M. J. Weber (Ed. ), Handbook of Laser Science and Technology , Supplement 1: Lasers (CRC, Boca Raton, 1991). M. J. Weber, Handbook of Laser Wavelengths (CRC, New York, 1999). 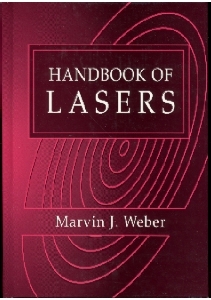 M. J. Weber, Handbook of Lasers (CRC, New York, 2001). M. Young, Optics and Lasers (Springer-Verlag, Berlin, 1993). P. S. Zory (Ed. ), Quantum Well Lasers (Academic, New York, 1993). B. Bederson and H. Walther, Advances in Atomic, Molecular, and Optical Physics (Academic, New York, 2001). F. J. Duarte (Ed. ), Tunable Laser Applications (Marcel-Dekker, New York, 1995). R. Measures, Laser Remote Sensing (Wiley, New York, 1984). R. A. Meyers (Ed. ), Encyclopedia of Analytical Chemistry (Wiley, Chichester, 2000). A. Mooradian, T. Jaeger, and P. Stokseth (Eds. ), Tunable Lasers and Aplications (Springer-Verlag, Berlin, 1976). L. J. Radziemski, R. W. Solarz, and J. A. Paisner (Eds. ), Laser Spectroscopy and its Applications (Marcel-Dekker,New York, 1987). J. F. Ready, Industrial Applications of Lasers , 2nd Edition (Academic, New York, 1997). J. F. Ready and R. K. Erf (Eds. 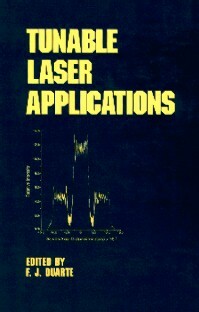 ),Laser Applications (Academic, New York, 1984). Published on the 7th of January, 2002.; Updated on the 24th of January, 2019.